We’ve created a very casual taproom just east of downtown Bellevue that can seat about 300 people; minors are welcome until 8:00pm! It’s the most unique taproom space on the eastside and has a relaxed, industrial vibe. Grab a seat in the bar area, enjoy some great food, and watch our brewers create delicious, award-winning beer! Enjoy our private dining rooms and hospitality services; let us make your next event special and memorable. 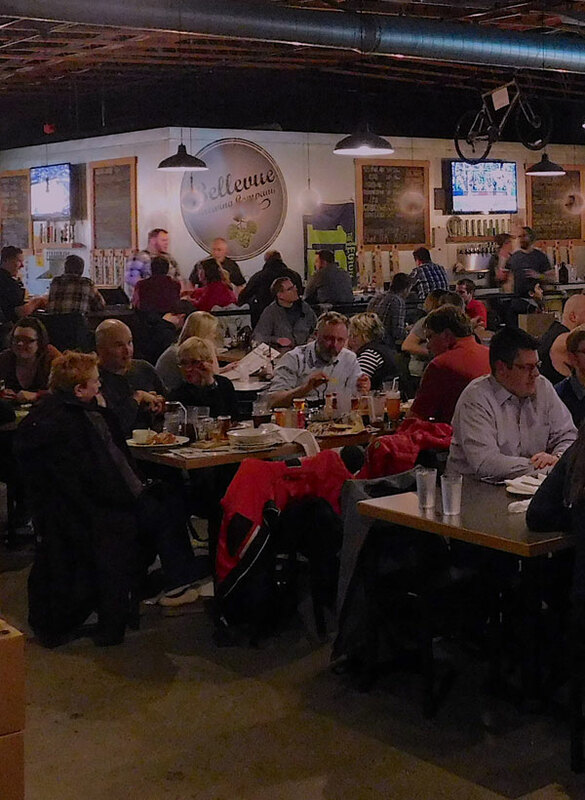 Whether in one of our smaller or larger rooms, our lounge area, or even our brewhouse space, you’re sure to have a great time with family, friends, and co-workers. The Eastside is a very family oriented community within the greater Puget Sound. Therefore, please feel free to bring the kids until 8:00pm. After 8:00pm, however, we’ve found that a more mature atmosphere prevails and we kindly encourage parents to be mindful of the changing energy in the taproom. There was a growing need on the Eastside for companies, private groups, and individuals alike to get together in a relaxed atmosphere for team building and social activities. To meet this need we created and proudly offer three, private hospitality rooms, a casual lounge area, and our brewhouse space so you can conduct your business or just have fun. Download our Hospitality Flyer to learn more and let us know how we can help create a memorable, hassle-free event for you! Download A Personal Copy Of Our Hospitality Flyer and Special Menu. Or, Send Us An Email With Your Questions. Our taproom policies have evolved over time with the goal to provide consistently high service levels to all guests. Reservations are available up to 1:00pm on weekdays. Make a reservation by email. We will gladly split a single check for groups up to eight (8). We will gladly accept multiple payments on a single check for parties of nine (9) or more. Parties of eight (8) or more without reservations may be seated once 50% of the guests have arrived and there is seating available. Minors are welcome until 8:00pm and we kindly encourage parents to be mindful of this policy.